Seraphim Guard is a publisher of great role-playing supplements for Fudge, RuneQuest and D20. Our products are listed in the menu to the left and can be safely purchased using the PayPal 'add to cart' buttons found throughout the site. You can puchase some of our products in hard-copy from Lulu. Here you will find several quality 4C (four color) RPG pdfs for purchase. Pick them up and add some interesting new material to your table top game. During the 1980s, the top RPG company of the day released a super-heroes role-playing game that had a MARVELous universe as its setting. Support for and interest in this system stretches to today, even though the game is long out of print. Phil Reed of Ronin Arts, one of today's top PDF publishers,just released a set of super-hero role-playing rules compatible with that classic game and has donated the rules to the public domain, making them free to one and all. In conjunction with Ronin Arts, Seraphim Guard is making those rules available to you, as a free download. This updated .zip file contains a Word document with both the Basic and Advanced versions of the rules and PDFs of the tables for both versions of the rules. (link) Publishers who wish to publish their own Four Colors characters, rules and setting, as well as game masters who want to customize the rules for their own games are welcome to download this archive for their own use. Four Colors has been released to the public domain by the author, making it freely available to everyone. The final Four Colors PDF is available for free (!) download from the Seraphim Guard website (link). Costumed superheroes with larger than life powers can be a lot of fun, but so can heroes a little lower on the power scale. Super Agents provides rules for role playing secret agent characters (like James Bond and Jack Bauer), pulp-era heroes (like Indiana Jones and H.P. Lovecraft's investigators), characters with a handful of minor super powers (like Luke Skywalker and Buffy the Vampire Slayer) and vigilantes who get most or all of their abilities from training, not supernatural powers (like the Phantom and the Punisher). Written by Andrew Domino 4C Super Agents is his take on playing less 'fanciful' Super Agent characters in 4C. Set in a world where P.A.R. (Private Action Response), a special operations organization is devoted to solving the world's problems while keeping a low profile. Players take on the persona of Super Agents fighting Evil Dictators and Greedy Corporate Tycoons. 4C Agents is 12 pages long. It has 5 pages of alternate rules for 4C a 1 page setting overview and 6 one page character write ups. Check out 'Super Teams Super Bases' by Scott Moore. A great resource for creating complex well-oiled Super Teams and awesome Bases for them to occupy! 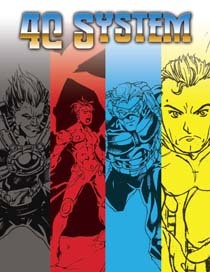 While created for the 4C system the information contained in the 33 page supplement is easily converted into whatever system you are using to power your Super Hero campaign. Scott took a higher level look at Super Team and Super Base building and fills in the blanks that most games leave empty. You can safely purchase the pdf for only $6.25 from our paypal powered shop.